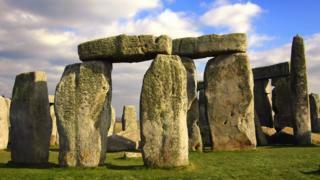 Construction of a tunnel past Stonehenge could destroy an Ice Age archaeological site, experts have warned. Blick Mead, close to the Wiltshire stone circle, is the only place in Britain where human habitation can be traced back to 8,000BC. An archaeologist has claimed a public consultation map deliberately minimises the impact of the road on the site. Highways England said the plans were "never intended as a geographical map". Perfectly preserved hoofprints of wild cattle known as aurochs have recently been found the Blick Mead site about a mile from the stone circle. The 6,000-year-old prints, preserved in what appears to be a ritualistic manner, are the latest finds in a decade-long dig at the site, which Prof David Jacques said formed a "national archive of British history". The tunnel proposal, which is part of £1.6bn upgrade to the A303, which links the M3 from London to the M5 to the south-west of England. A public consultation on the scheme begins on 8 February. However, Prof Jacques, from the University of Buckingham, said a map of the route has put Blick Mead in the wrong place, where construction of the flyover and tunnel would be less damaging. He claims its actual location is beneath the proposed footings of an 8m-high flyover. The archaeologist also claims construction work on a tunnel and flyover would lower the water table, drying out the peat and silt conditions which preserve archaeological remains. "Essentially the place is like a national archive for organic material which are like documents. It would be like destroying a unique library," he said. The government has backed plans to put the A303 into a tunnel as it passes the stone circle to ease congestion and improve the setting of the World Heritage site. The plans include eastern and western entrances to the tunnel and a possible flyover at the Countess Roundabout near Amesbury. David Bullock, from Highways England, said: "The document in question is a land ownership boundary plan. "The plan shows indicative general features and was never intended as a geographical map."